This medium to large scrambling shrub with its beautiful leaf patterns produces pink flowers towards the end of the year. It is an interesting plant for gardeners in frost free areas looking for something different. Caesalpinia rostrata is a large, scrambling woody shrub that grows up to 3 metres and can on occasion form dense thickets. The main stem is armed with hooked thorns that can reach up to 10 mm. The leaves are twice-compound with small leaflets and an asymmetrical base and rounded tips. The petiole (leaf stalk) is 6 - 15 mm long. The pink flowers are produced from November to January in terminal or axillary racemes. The fruits, produced from January to February, are short, inflated pods of about 27-32 mm length. The pods are tipped with a characteristic beak. 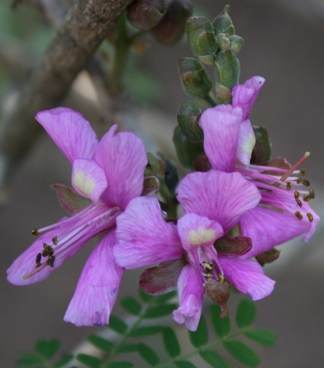 According to the Red List of South African Plants Caesalpinia rostrata is categorized as Vulnerable (VU). This means that "the best available evidence indicates that it meets at least one of the five IUCN criteria for Vulnerable, indicating that the species is facing a high risk of extinction." Habitat loss to sugarcane cultivation seems to be the main threat. 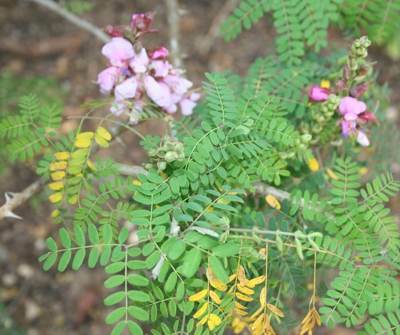 Caesalpinia rostrata grows in Bushveld, often along river valleys and drainage lines in isolated localities in southern Mozambique and eastern parts of Mpumalanga. The genus name Caesalpinia was given in commemoration of botanist and physician A. Caesalpinius, who died in 1603. The specific name rostrata means beaked and refers to the seedpods. The nectar-rich flowers attract bees and other insects. No traditional uses reported. Even though this isn't a plant commonly found in nurseries if you are able to source it, it makes for a good garden subject with its pink flowers and with its tendency to form thickets it can be used as a hedge or barrier plant in areas where it is evergreen. 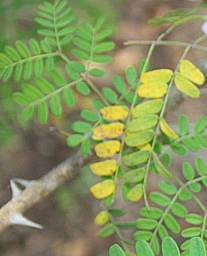 Caesalpinia rostrata is evergreen to deciduous depending on the prevailing conditions. It is not frost-resistant, prefers full sun and needs to be watered once a week. It can be grown from seed. Leave the seed in boiling water for 5 minutes to soften it up and loosen the seed covering. Then leave in cold water over night. Sow in seedbeds with an even amount of river sand and soil. Water twice a week. Seedlings start appearing within two weeks. The seedlings can be planted out when they have reached 10 cm in height. Schmidt, E., Lötter, M. & McCleland, W. 2002. 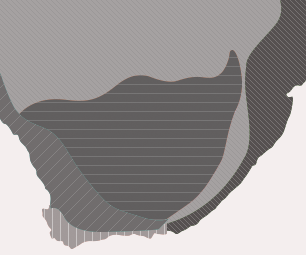 Trees and shrubs of Mpumalanga and Kruger National Park. Jacana, Johannesburg. Van Wyk, B., Van den Berg, E., Coates Palgrave, M. & Jordaan, M. 2011. Dictionary of names for southern African trees. Briza Publications, Pretoria.